I was baking the other day and was looking around my kitchen and I randomly thought to myself, quick, name your 5 favorite gadgets and this is what popped in my head, they are listed in no particular order. Please leave a comment and tell me what your favorites are. I use this at least 2 times a week, this is actually my second one, I sold the first one (it was white) and decided on this nice bright orange one -$ 399.99 – awesome price, especially when they go on sale, like this one did. Even though I have a dishwasher, there are plenty of times I need to hand wash pots or pans . This fabulous little mat soaks up water, dries quickly, stores easily and can be thrown in the washer if it happens to get dirty. Mine is pretty old now but if memory serves me correctly, I paid $6.99. I’ve since gone out and purchased a second one – bright orange …I think I have a think for orange. Ah my zester…I have had this for many years. I am a gadget girl and I love Lee Valley – they have some awesome gadgets. This will only set you back about $24.00 and you’ll have it forever. I use lots of zest in my loaves and it really works well. With that little holder attached , you won’t lose a single strand of your zest. It’s great for lemons, limes, oranges and even with hard cheese for use on pasta and salads AND it’s dishwasher safe. The very best thing about these cutting mats is the price $1.99 for two. 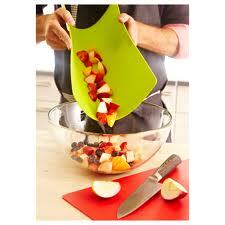 They are flexible so you can chop your food then lift, flex and pour right into your pot, bowl or plate. Sort of sounds like I’m promoting and exercise video…hahaha! Unfortunately they are handwash only. We assigned the red one for meats only and the green one for fruits and vegetables. This one is our newest gadget from Lee Valley. I have to admit I am not the one who cuts, chops or minces the garlic so when Mr. Wanda-ful insisted on buying it, what could I say. BTW he is a gadget lover too. This cost $19.50 and has, in my opinion, already won me over. I needed 6 cloves of garlic the other day and before I could say please and thank you they were ready to add to my dish. Mr. W is such a big sweetie and loves to help in the kitchen – yay, lucky me!! What about your five favorite blogs? Books and/or authors? decorating advice?